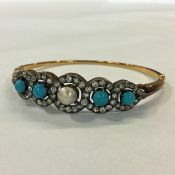 Discover our Selection of Antique Bracelets, Vintage Bracelets, Estate Bracelets and Modern Bracelets. Please See Below The Subcategories For Additional Selection. For a Greater Selection, Contact Us. One custom-made 14 karat yellow gold hinged bangle. Seven pearls. Thirty-six turquoise. One 14 karat yellow gold bracelet. Five oval cabochon moonstones (9.17 carats). The bracelet is 8 inches in length. One gold filled hinged bangle. One oval cabochon garnet (5.52 carats). Fifty-six round facetted cut garnets (9.81 carats). One antique 14 karat yellow gold bangle. One peridot (1.27 carats). Two peridots (0.78 carats). Thirty-six seed pearls. One 14 karat yellow gold antique bangle. Thirty-three white seed pearls. One 14 karat yellow gold filigree bracelet. Fourteen round cabochon turquoise. The bracelet is seven inches in length. One nine karat rose gold vintage bracelet. Three moonstones. One nine karat yellow gold bracelet. Four turquoise beads. Four imitation pearls. 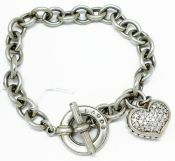 The bracelet has a heart shaped lock clasp and safety chain. One silver tennis bracelet. Forty-one aquamarines (16.39 carats). The bracelet is 7.25'' in length. One custom-made 10 karat rose gold and silver bracelet. Twenty-four synthetic rubies (5.04 carats). Twenty-four zircons (4.92 carats). One 18 karat yellow gold bracelet. Six cabochon moonstones (20.10 carats). 8.25'' in length. One 18 karat yellow gold 8'' curb link bracelet. The bracelet is accompanied by a 22 karat 1957 yellow gold sovereign coin charm. One 15 karat yellow gold bracelet with a heart shaped clasp measuring seven inches in length. One custom-made 14 karat yellow gold bangle. Three green tourmlaines (3.02 carats). 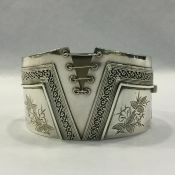 The bracelet has white and black enamel detailing. One 14 karat rose gold retro bracelet. Five rectangular facetted blue topaz (31.70 carats). Five rectangular raise middle black onyx pieces. One nine karat yellow gold filled hinged bangle. One pink sapphire (0.13 carats). Nine seed pearls. One nine karat yellow gold hinged bangle. The bangle has blue enamel flower and green leaf motif. One yellow gold bracelet. Thirty-two cultured pearls. Four gold beads, two gold dividers and a circular clasp. Twenty lapis lazuli beads. One 14 karat yellow gold 7`` bracelet. Twenty-two freshwater baroque pearls with cream rose colour and high luster. One 14 karat yellow gold hinged bangle. Three mabe pearls of silver colour with silvery gray overtones. One nine karat antique hinged bangle. Sixty-three garnets (16.65 carats). One platinum antique bracelet. Seventeen garnets (8.53 carats). Twenty round brilliant cut diamonds (1.17 carats: VS-SI1 clarity: F-G colour). 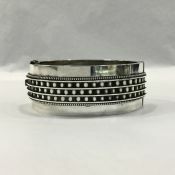 One 18 karat white gold art deco bracelet. 296 round brilliant cut diamonds (1.98 carats: SI clarity: G-H colour). 7.25’’ in length. One platinum diamond bracelet. Fifty-three round brilliant cut diamonds (3.49 carats: VS1-SI2 clarity: G-H colour). The bracelet is 7.25`` in length. One 14 karat yellow gold bangle. One sapphire (1.49 carats). Six old European cut diamonds (0.11 carats: SI-I clarity: H-I colour). One 15 karat yellow gold bracelet. One amethyst (1.91 carats). Fourteen seed pearls. The bracelet is 7.75'' long. One 14 karat yellow gold bracelet. Ten sapphires (1.42 carats). Ten rubies (1.42 carats). The bracelet is 7’’ in length. One 10 karat white gold tennis bracelet. Forty-five single cut diamonds (1.13 carats: I1 clarity: G-H colour). 7.5’’ long. One custom made 14 karat yellow gold bangle. Ten aquamarines (12.21 carats). One lady’s silver diopside and ruby bracelet. Eleven diopside (5.99 carats). Thirty-three rubies (1.13 carats). One estate, 10 karat yellow gold and rhodium plated hinged bangle. Twenty-three single cut diamonds (0.35 carats: SI-I1 clarity: H-I colour). 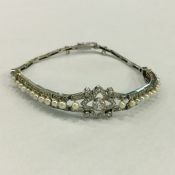 One art deco platinum straight-line tennis bracelet. Forty blue sapphires (18.74 carats). Size 7 ¼’’ in length. One vintage, 14 karat white gold diamond hinged bangle. Twenty-five round brilliant cut diamonds (0.41 carats: VS-SI clarity: H-I colour). Classic, 14 karat yellow and white gold bracelet. Twenty-two sapphires (1.46 carats: deep blue colour). 7 ½’’ long.